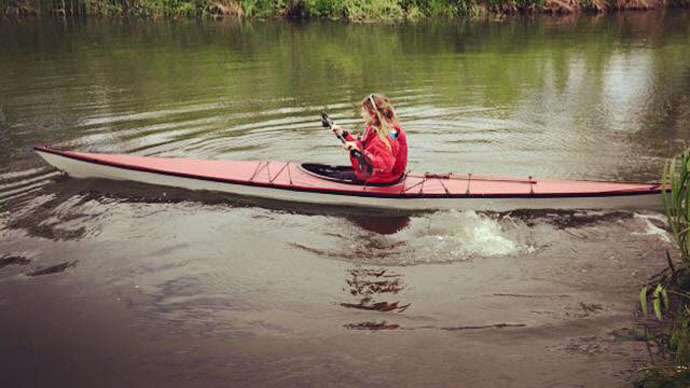 A personal trainer by profession and adventure-seeker by nature, Laura Kennington from Britain is doing something no other woman has ever done before – kayaking Russia’s Volga from source to sea. The Volga, Europe’s longest river, is over 3,600km long – more than double the length of Englan. It flows through central Russia and into the Caspian Sea. Laura says that it was this impressive length that first appealed to her, but the thought of visiting Russia, a country she’d never been to before, was the deal breaker. “I am surprised at how friendly the Russian people are. It is certainly hard to shake stereotypes." As I was planning my trip I noticed that most of the villains in the James Bond films are Russian. But I am overwhelmed by the hospitality and the kindness, and that has really taken me by surprise,” she said. She plans on kayaking around 50km each day, which will take her about 12 hours, and estimates that at this rate she shall reach the Caspian Sea within three months. And a different story it will be – a girl, alone with her foldable kayak, in which she has packed her whole life: Food provisions, a stove, sleeping bag, and a pillow for a bit of extra comfort! “I’ll be washing in the river, I have a water filter to make the water safe so I’ll be drinking from the river. Yeah, living, sleeping by it…this is home now!” Laura said smiling. But there is also another very important element that is pushing Laura to break boundaries: Collecting money for a children’s charity whose cause she feels very close to. “I am proudly collecting money for the children charity ‘Hope and Homes for Children’. I chose them because I feel very fortunate to have come from a loving family…they take children out of orphanages and institution and ensure they have the opportunity to grow up in a family”. Although she is running on a tight schedule, Laura also hopes she will be able to fit in some sightseeing too. Ten out of Russia’s 20 largest cities are located along the Volga basin, as well as countless monasteries, beautiful and diverse landscapes, as well as some exotic wildlife, including flamingoes and pelicans.